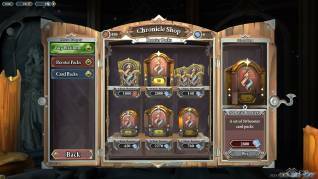 Jagex Games Studio, developers of the popular MMORPG RuneScape, has recently put their new free to play card collecting MMO into open beta, the titled Chronicle: RuneScape Legends sees the legacy of RuneScape continued in this full 3D card game… with a twist. Knowing very little about the game other than it being a CCG style MMO we boldly jumped into the game to see what Jagex had in store for us. The game loaded up with this elaborate wizards tomb, or book of legends, or some such opening up with 3D animation to reveal a kind of 3D popup book scene of a landscape/battleground that would be the home of our first battle. On the other side of the book we saw the 3D figure of our opponent, Ariane the Mage, crossing that battlemap meets tabletop game element. The most striking thing about the 3D graphics, general UI and the cards that were put into our hand was just how much it resembled Blizzards’ own Hearthstone; the cute illustrative style and chunky graphics are far from anything we’ve seen in RuneScape’s other IP and we dare say the similarities aren’t by accident. That’s about where the similarities between Hearthstone and, well, any other card game go. The game is like nothing we’ve played before and unfortunately the tutorial did a bit of a confusing job of telling us what we had to do. The basic premise is that you get your deck, you draw cards into your hand, and then you place them onto the game board in four different locations on a path that your own hero character will travel. 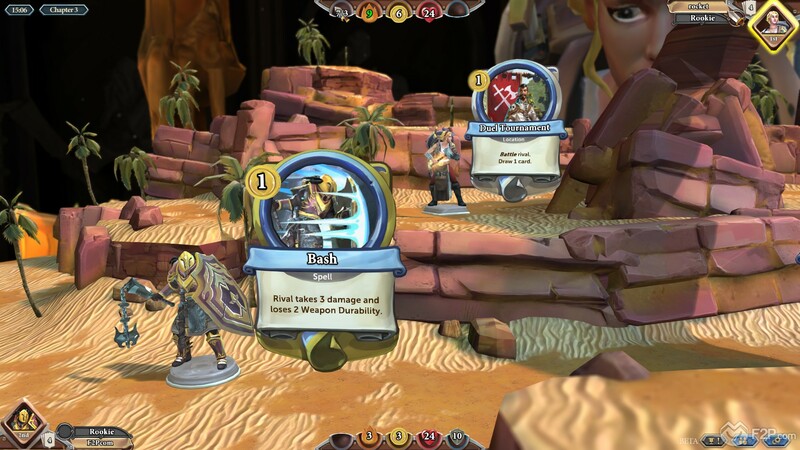 Essentially they will face and defeat these cards in order, that’s the big twist, unlike other TCGs where you generally place cards to go directly against your opponent you are instead placing cards for your own hero to fight; placing down a Creature card from your hand that will potentially deal damage to your hero/Chronicle, that when defeated might drop some health points, some armor points, extra damage, a weapon or gold coins to boost your character. We were informed that Creature cards we’d have to battle against, with our own hero having hitpoints and a damage score they would have to fight them, whereas Support cards had a cost in Gold Coins that you needed to meet in order to “defeat” the card. 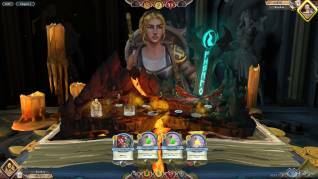 Our first task for the tutorial was to place down all 4 cards in our hand onto the map, which we did… but then some were greyed out and we couldn’t continue into the actual match. So we tried them in a different order; no success. After a few attempts we realised that the issue we had was with the Support card as we needed 2 coins to “defeat” it, but we started with none, only then realising if we placed the two Creature cards before it that dropped 1 gold coin each when defeated would then ensure we had 2 coins when reaching the support card. Whilst badly explained it was an interesting mechanic that the game would pre-empt what resources you should have before you get to that point. 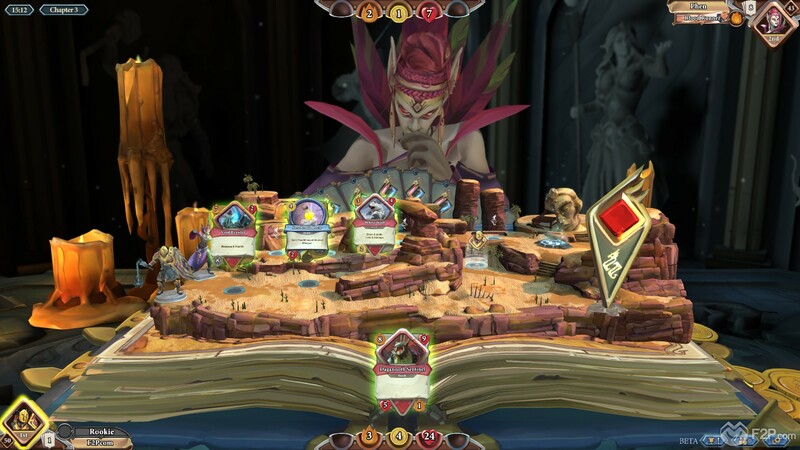 The match is made up of 5 stages, each a different 3D map area, with 4 cards placed from your hand each time in an attempt to try and build up your own Chronicle character whilst simultaneously hurting or hindering your opponent’s Chronicle through the effects various cards you defeat might have (e.g. reducing the opponents hitpoints, stealing their gold, etc.). 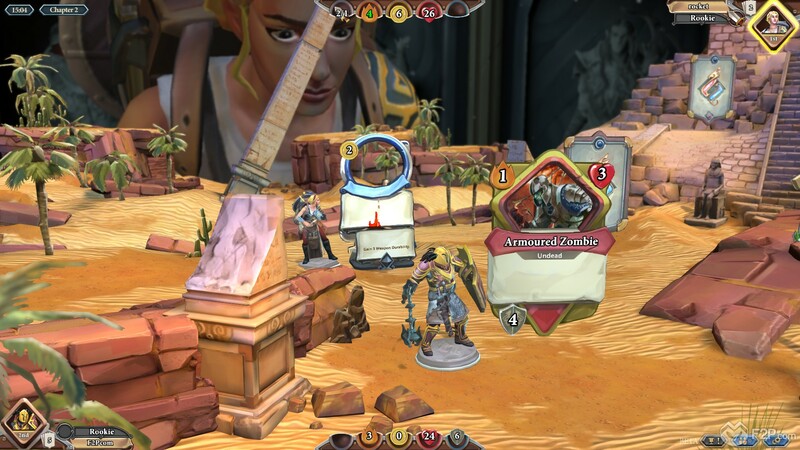 You are able to gather armor, weapons and other buffs to make you stronger throughout the fight, which in turn allows you to place and defeat stronger cards that grant greater boosts or deal more significant damage to your rival. 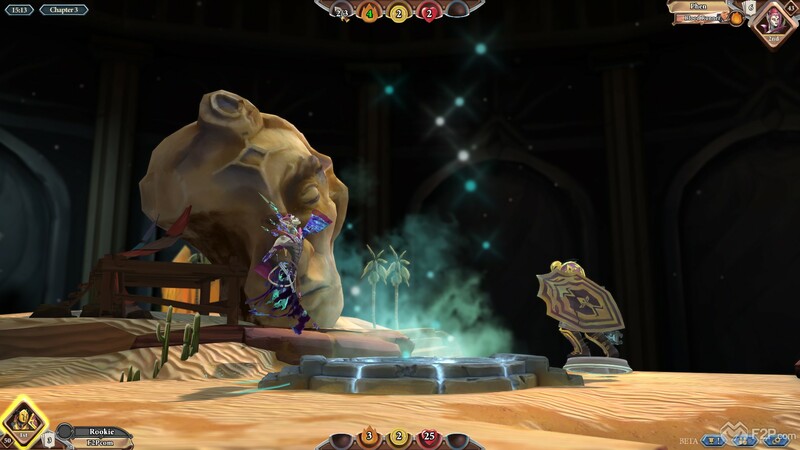 By dropping your opponent to zero hitpoints they are defeated, otherwise if both players reach the end of the five stages then the two Chronicles simply have a showdown and take it in turns hitting each other, and so the accumulated armor, weapons, damage and healthpoints they have gathered through the match become more significant. 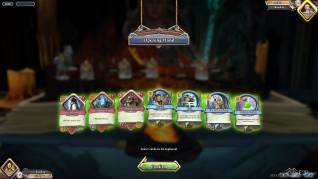 Once we’d gotten to grips with the game we played through a few matches, there’s a casual mode for 1 v 1 duels where you use the basic deck for your chosen class (there’s five class of character available which have a different playstyle each) or you can battle in ranked play. Whilst we had the basics in mind it was only once we started playing that we realised just how strategic the game becomes and it is a constant juggling act where you need to balance building up your character and penalizing your opponent. The cards we put in front of our own hero would help to build us up over time, but just as important was how we could damage our opponent; one of our cards seemed to be ideal for the job and was a dragon Creature card that had a lot of hitpoints and attack, but when killed dealt ten whole points of damage to the enemy! We were in luck as we’d also drawn a Support card that (once defeated) would reduce our next Creature’s attack (ie. the dragon) by four, then going into another Support card that reduced our next Creature’s hitpoints (still the dragon) by four seemed like a sure bet to stack them up before we fought the dragon card and smash our rival. What we hadn’t accounted for was prior to reaching the first Support card our rival played a card that stole our coins... so when reaching both the Support cards we couldn’t activate them… and then had to face the dragon at full strength and got absolutely battered by it. Definitely a high-risk-high-reward play and made us realise just how much you can hinder your opponent. Whilst overall we probably lost more than we won we did manage to make some plays of our own; trying to second guess where you think your opponent might be placing a strong Creature card managing to reduce their armor or remove their weapon right before the fight is extremely rewarding, but as often we’d make plays that wouldn’t quite pull off as we still hadn’t mastered the nuances of the match. 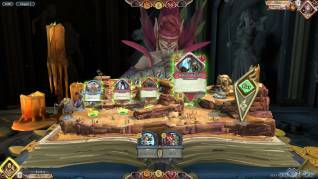 Deck building is an option for both the 1 v 1 games as well as the Dungeon mode where you can battle through 12 fights to try and earn more rewards the further you get (similar to Hearthstone’s Arena mode). We got a free attempt at the Dungeon and had to build a deck for it, with no idea what we were doing we got two stages in before we found ourselves with no coins to get passed any Support cards, and a bunch of high level Creature cards we had no chance of defeating. After our failed attempt we’d need to build up Copper Coins to make another run at it. 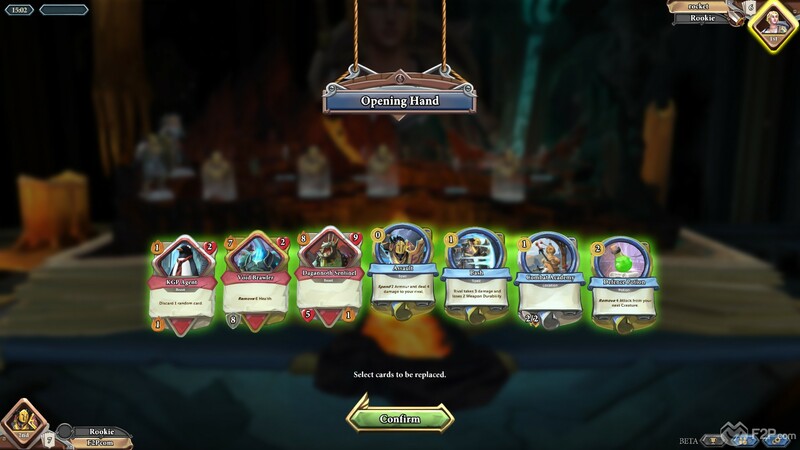 Overall we really enjoyed the game and the new approach definitely was refreshing given that the CCG/TCG genre is one that seems to be oversaturated with similar candidates. Whilst the graphics for the most part were impeccable and the 3D landscapes really did look impressive, the card artwork of the creatures was at times of a much lower quality and looked like images had been scaled up from smaller versions leaving them quite pixelated. The animations from your Chronicle characters were probably the weakest aspect and they were extremely clunky and minimalistic, which is a shame given the amount of effort put into every other area. With more cards and classes the game is definitely heading in the right direction to be a strong contender in the genre, it has that right blend of casual meets tactical that Hearthstone has so successfully catered towards and we can only hope Chronicle sees a similar success.